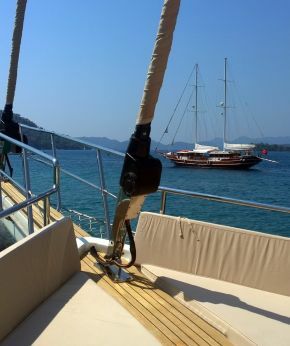 crewed yacht charter bodrum Holiday need to choose the group of friends to spend their holidays with, very carefully…! these people may ruin your holiday since they pay the same amount of money and you may really end up with a sour holiday…! We transfer you and your luggages from the Airport to the yacht harbour and we have a welcome coctail as soon as you arrive on board our yacht, captain will inform you shortly about Do´s and Donot do´s for our comfort and safety on board. this is a no mans land , no constructions none whatsoever , if you are planning to dine out you may try yalniz restaurant at Hisaronu They serve fresh fish calamar and octopus at their best. you really have made the right desicion to spend your holiday on a yacht. when you wake up in the morning. Here we are at seven islands, Camalti bay , you can go ashore walk on the beach or swim after fishes, the natural beauty of This place is stunning.